Start by making the sauce. Rinse and dry the parsley and finely chop. Chop the garlic and red onion. Remove seeds and white innards from the pepper and finely chop. Add more chopped pepper according to your preferences and spice tolerance. Transfer ingredients to a bowl and mix. Place the mackerel in a deep dish. Pour half of the chimichurri over the mackerel. Cover with plastic foil and let marinate for at least one hour. Turn the barbeque on. Make sure the barbeque is oiled so the fish doesn’t stick. Grill the fish for a few minutes on both sides. 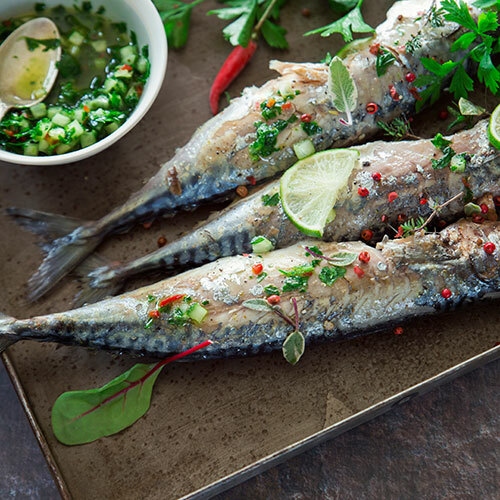 Serve the fish with the rest of the chimichurri.